One of the most awaited model of JK mini crane is now officially launched. The First JKmini1000 is going to be shipped to M/s. Technocom Construction Pvt. Ltd., Bangalore. The designing, development and testing of JKmini1000 took almost over 6 months of hard work and dedication. One of the major challenges faced while designing this mini crane was that mini crane’s height was higher than the net clearance provided between any two slabs. A major redesigning was required and now the mini crane’s height is at 6 Ft, clearly 2 Ft below the lowest beam. JKmini1000 model differs in its boom length by 0.5 ft when compared to mini crane with 500 Kg capacity. Another key change is in the build quality of the machine in accordance with its weight lifting capacity. 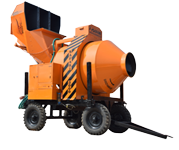 JKmini1000 has 1 Ton capacity, can carry load upto 500 Ft/150 meters. Its bucket size is L 1035 x W 1035 x H 560 mm . Volume is 415 liters. Total weight is 950 kg. JKmini1000 will also be available with other options of boom length. JKmini1000 is very convenient due to its low weight, mobility and can be used immediately without any foundation. Smart Counter Weight boxes ensure that the mini crane is properly balanced. Also, included is the feature of auto mechanical brakes which is a must for safety during power and/or drive failure. 1 Ton capacity mini crane is a very good affordable alternative to small capacity tower cranes. It can be used to lift bath tub, marble, steel rods, tiles, sand, cement, bricks and almost every other building material. Along with applications in the construction industry, this mini crane has utility in dam and bridge works, quarries & chemical factories for all kind of material handling activities.